So I started this blog on 01/04/2013, which was a REALLY BAD day for me and I finally lost the plot. 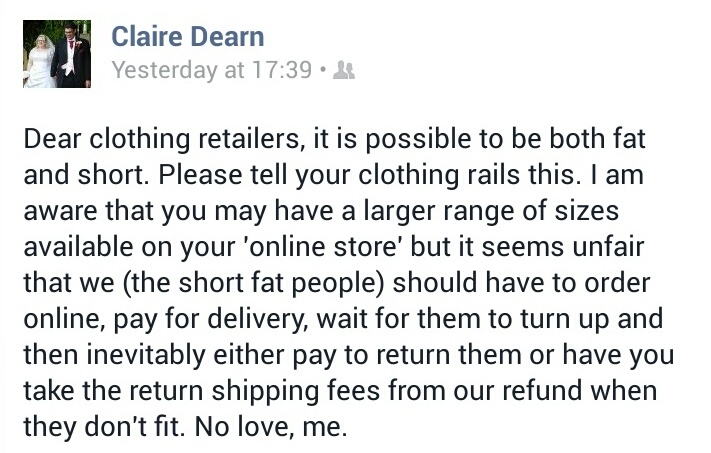 After a clothes shopping trip I was so incensed by the lack of clothing for women of my body shape and size that I posted this (see image) on Facebook. I know alot of the glossies and blogs do in fact publish alot of budget friendly jeans, but unfortunately none of these seem to have so far suited my odd bod, so I’m on a mission to find the best I can. Whilst I am not adverse to paying good money for good quality items, I am on an extremely limited budget and cannot afford to buy loads of these as my ‘everyday jeans’ and know I cannot be the only one in this situation. I want you to share your changing room nightmares as I share mine, as well as those wonderful moments when you find your perfect jeans or have gone down a size or there’s new brand/jean styly you’ve found that takes us odd-bods into consideration. I want to hear about the amazing shoes you got on sale or the new jacket…you get the general idea. I want this to be as much your journey as it is my own. So please (pretty please) subscribe/follow my blog, via WordPress or email, drop me a line at claire@clairedearn.co.uk, or fatgirlskinnyjeansblog@gmail.com tweet me @fgsjblog or leave a comment down below (on any page). I hope you both enjoy and (hopefully) find it useful!